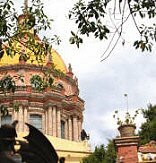 T here are Religious Meetings and Church Services in San Miguel de Allende to meet the needs of most travelers and expatriate residents, as well as the local Mexican population. Religious meetings in San Miguel cover the gamut from the expected Catholic services to Baha'i, Episcopal, Jehovah's Witness, Jewish, Latter Day Saints (Mormon) and many other denominations and belief systems. There are many English language church services in San Miguel de Allende. Note: This information was current at the time of writing. Always call to confirm details of time, place and location. Call for information on other services, The Jewish Forum, Sharing Shabbat, holidays, etc. When looking for religious meetings and church services in San Miguel, always call ahead for exact details.